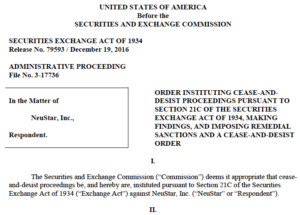 On December 19, 2016, the U.S. Securities and Exchange Commission (the “SEC” or “Commission”) entered an Order sanctioning NeuStar, Inc. (“NeuStar”) for impeding SEC whistleblowers from reporting to the Commission. The SEC found that two provisions in NeuStar’s severance agreements contravened SEC whistleblower protections by impeding SEC whistleblowers from reporting to the Commission. The first provision was a non-disparagement clause. The second provision discussed in the Order was a forfeiture clause. That provision stated that if the employee violated the non-disparagement clause, the employee would forfeit all of his or her severance compensation except for $100. According to the Order, over a period of approximately three years and nine months, at least 246 NeuStar employees signed severance agreements containing the non-disparagement and forfeiture clauses. The Order acknowledged that the SEC had not uncovered any instances in which NeuStar attempted to enforce the non-disparagement clause against former employees. However, according to the Order, “at least one former NeuStar employee was impeded by the Nondisparagement Clause from communicating with the Commission”. No person may take any action to impede an individual from communicating directly with the Commission staff about a possible securities law violation, including enforcing, or threatening to enforce, a confidentiality agreement … with respect to such communications. In a press release about the Order, an Associate Director of the SEC’s Division of Enforcement explained, “Public companies cannot use severance agreements to impede whistleblowers from communicating with the SEC about a possible securities law violation”. In addition, nothing herein prohibits me from communicating, without notice to or approval by NeuStar, with any federal government agency about a potential violation of federal law or regulation. The SEC ordered NeuStar to pay a civil monetary penalty of $180,000. (3) provide them with “a statement that NeuStar does not prohibit former employees from communicating any concerns about potential violations of law or regulation to the Securities and Exchange Commission”. This action demonstrates our continued strong enforcement of this critically important whistleblower protection rule and underscores our ongoing commitment to ensuring that potential whistleblowers can freely communicate with the SEC about possible securities law violations.